Mount Tukunikivatz and Mount Peale, from Canyon Rims. In the morning after my camp at Canyon Rims, there was a new coating of snow on the ground. The La Sal Mountains were mostly visible amid the clouds still breaking up as the storm front continued its way into western Colorado. Canyonlands National Park, from Needles Overlook in Canyon Rims. Red, blue and white: the La Sal Mountains from the Hatch Point area. New snow on the red rocks. Fresh snow on the red rocks, Highway 191 south of Moab. I spent several hours photographing the scenery with its new coat of white. Then it was time to head down into Moab for a nice hot restaurant breakfast. 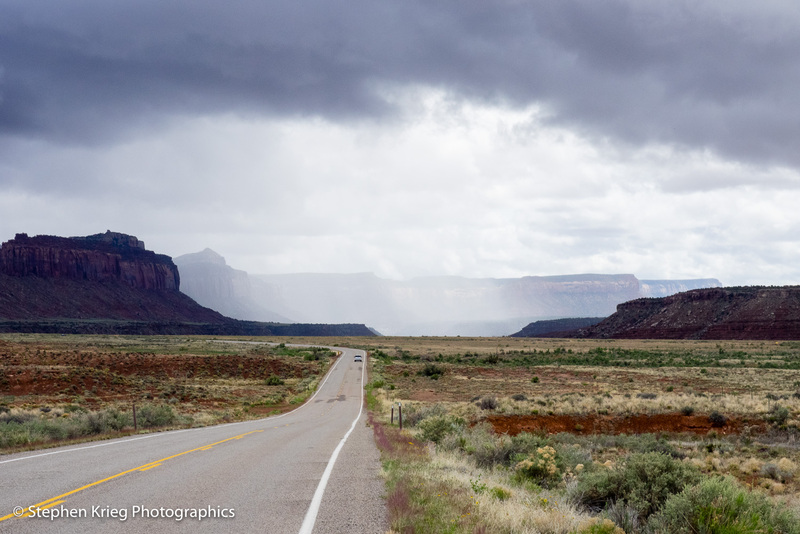 La Sal Mountains and red cliffs, Highway 191 south of Moab. 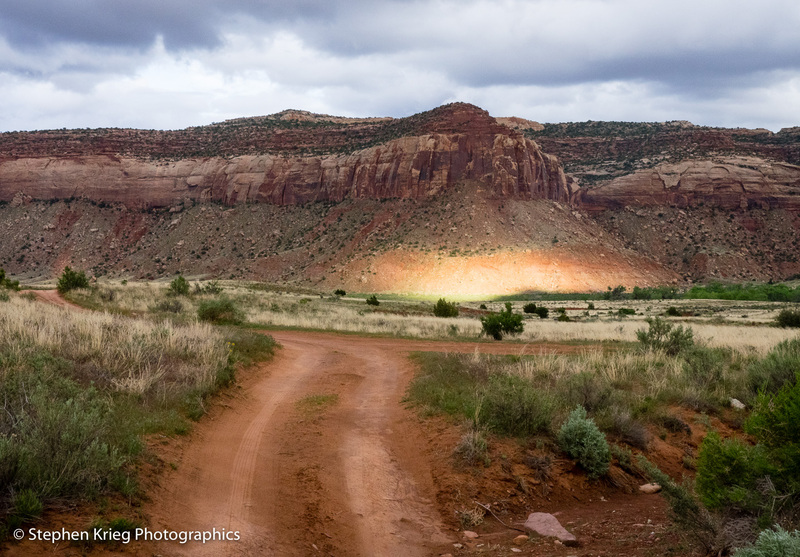 Photo Location: Canyon Rims Recreation Area, northern San Juan County, Utah. 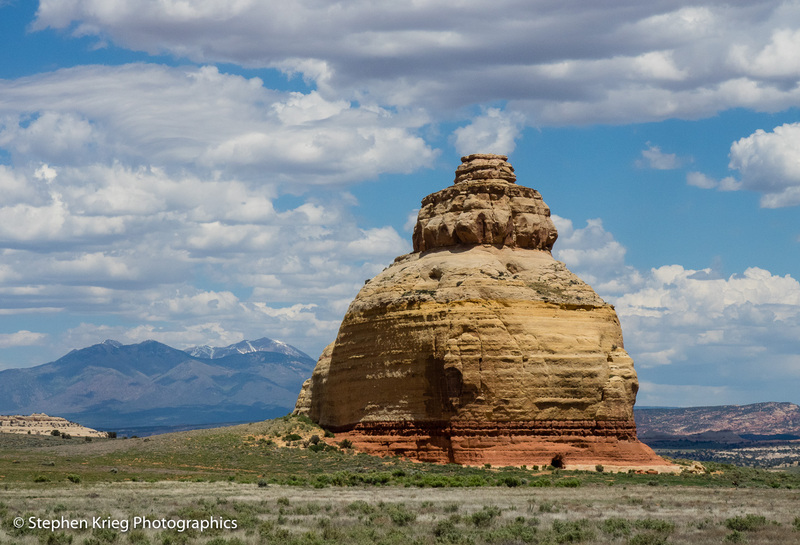 Church Rock, at Highway 191 north of Monticello, Utah. I was at the Canyonlands overlook in southeast Utah for this month’s Full Moon rise. The evening before Full Moon, that is. 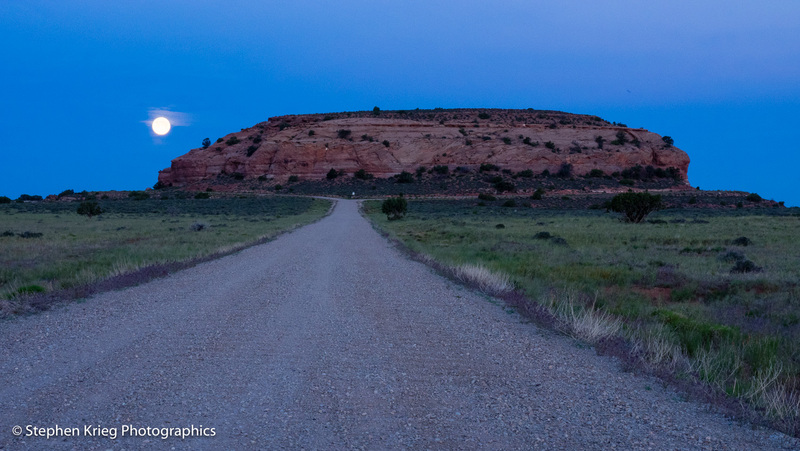 To strive for landscape photographs with the almost full moon rising before dark. Yes, one could merge separate images of a landscape and a closeup of the moon in Photoshop into a single composition. It’s incredibly easy these days, and will continue to get even more brain-dead simple. Which is one reason why I’m not interested in doing that. 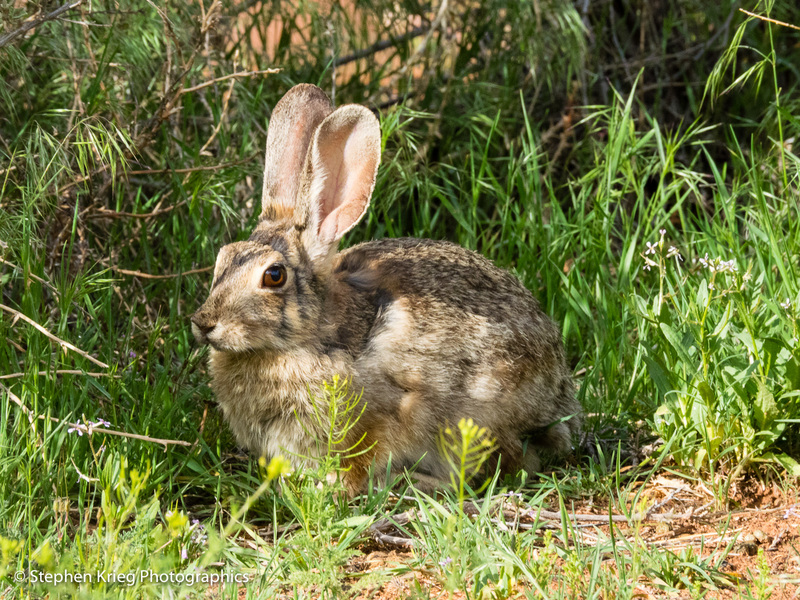 I use Photoshop and Lightroom for all my image processing, but not in that way. The reason isn’t ethics or creativity or whatever label you care to assign. It’s about being out there. Outside, in nature, to see what you can experience this time. It’s a treasure hunt–and the treasure might be hunting you. Your attention, your realization. The evening started with the afternoon. I veered off the known road for one of the side roads. To see what sights it might display. 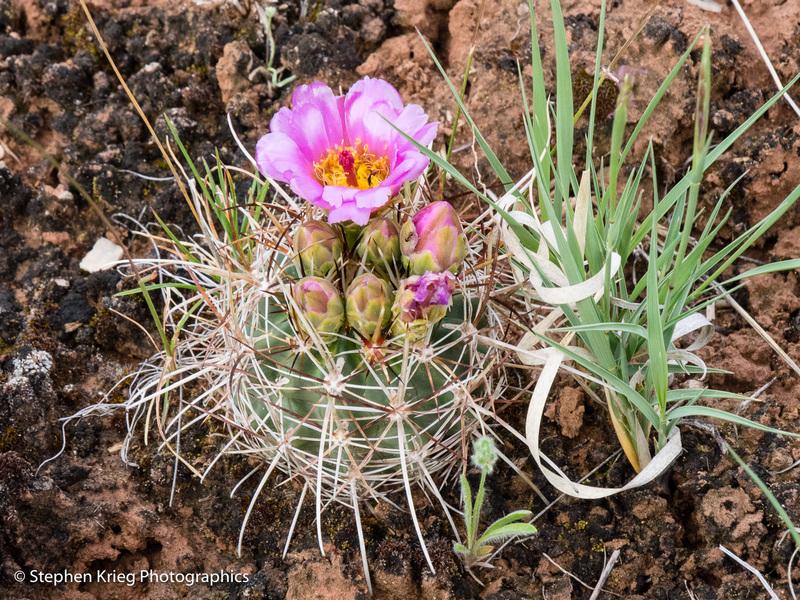 I had lots of hours to spare, and the weather and sweet high desert air were both soothing and stimulating. 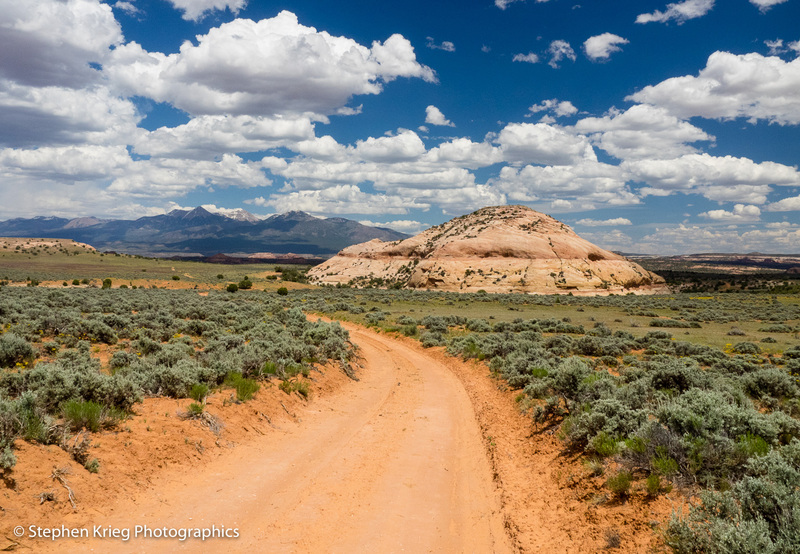 Cruising the red sand roads amongst the sagebrush and high desert skies. It was time to decide on a campsite. One with a great view of the La Sal Mountains to the east, over which the moon would rise somewhat before sunset. I arrived plenty early, unusually so. I set up my folding camp chair in the shade of a Utah Juniper tree near the edge of the cliff, and resumed reading a book. Waiting. La Sal Mountains moonrise panorama. Eventually the moon appeared, faintly, above the mountain horizon. Haze on the eastern skyline made it harder to notice until it was well above the slopes. By that time it was so far southeast of the main peaks of the La Sals that I decided to make a series of overlapping images to merge into high resolution panorama image in Photoshop later. It was the best I could do under the circumstances. The tail end of a lovely day in the high desert springtime. I settled in to sleep. At dawn, I peered up at the bright moon as it silently continued its arc to the southwest horizon. I roused myself. Most people don’t consider moonset. Heck, most don’t consider moonrise, until it slaps them in the face one night, once in a while. With moonset, the opportunities for landscape photography are greatly expanded. Most importantly, it’s already up in the sky, you don’t have to calculate or guess where it will appear. And, emotionally, it looks much like moonrise. It’s just the other end of the arc. The full moon above the landscape at one end of the day. You merely have to get up really early. A deal breaker for many people. That’s where I come in. Well, most of the time. Enough of the time. Usually. I threw my outside the-camp-belongings into the vehicle and headed toward the west rim of the peninsula. Overlooking Canyonlands National Park and the Colorado River. I approached a viewpoint I’d made note of on the drive north but hadn’t actually visited in the few times I’d been here. The time to visit seemed to be now. Moonset pancake, Anticline Overlook road, Utah. 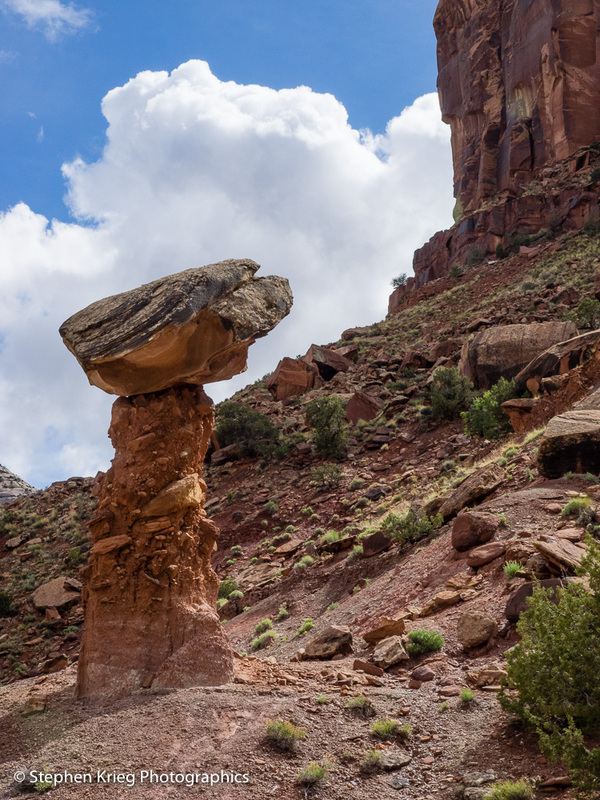 It was like a flat cake of sandstone layers sitting above the plateau. A road was built out to it, and around it, for a circular viewpoint. It occurred to me that, had I been engineering roads there, it wouldn’t have occurred to me to build one around that piece of rock. Maybe out to the edge of it, yes. But around it? Though lots of things don’t occur to me that probably should. Whatever. 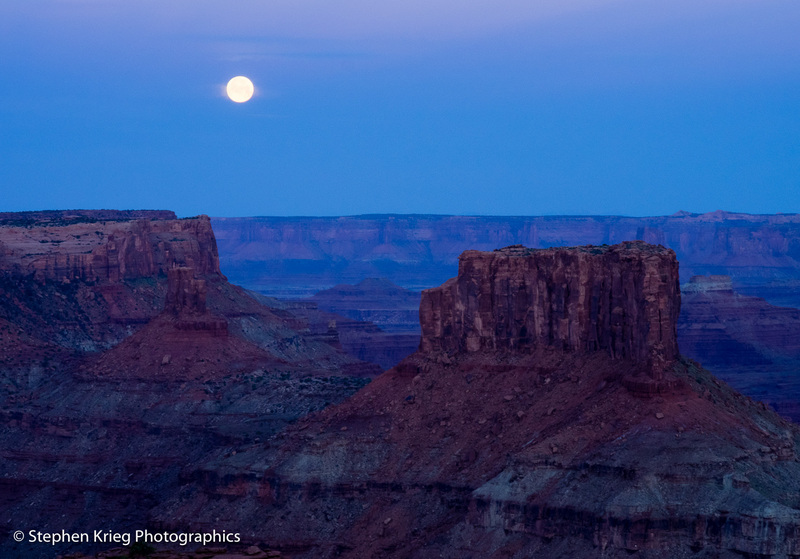 The moon was setting over Canyonlands, and the sun was soon rising onto them. I would have been quite satisfied with the day, given such a gorgeous beginning. Moonset over Colorado River canyon lands south of Moab, Utah. As it turned out, the day was far from done. But that’s another story.